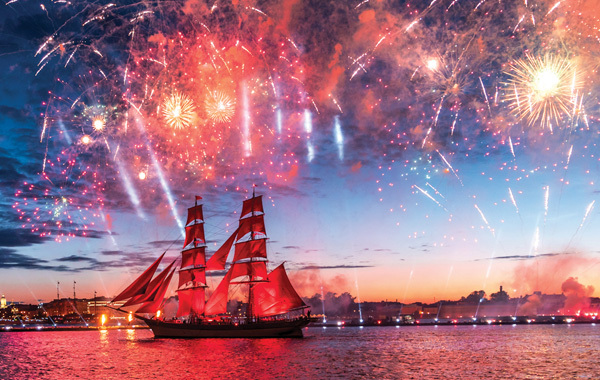 Travel with pioneering adventurer Geoffrey Kent for an unforgettable four nights in St. Petersburg as the city celebrates its annual White Nights Festival. Featuring VIP access and five-star hospitality, this luxury journey includes private tours of the Fabergé Museum and Alexander Palace, a ballet performance put on just for you, a gala evening at the Palace of Grand Duke Vladimir and exclusive balcony seating at the spectacular Scarlet Sails celebration, the highlight of the weeks-long festivities. Pushkin, known as the “Czar’s Village” is a treasure of Russian heritage. The Summer Palace was built in the 18th century and many aristocrats built their homes in the village also. Nicolas II and Alexandra made Pushkin their permanent home for several years beforetheir demise. The highlight of the village is a visit of Catherine’s Palace with its massive facade of white columns, trimmed with gold molding on a rich blue background.